The main idea of the list is that it has a core of fast moving, super durable monsters that start as a bit of a deathball surrounding the Malanthrope. Between Kraken's stratagem, Opportunistic Advance, the Metabolic Overdrive stratagem, and Swarmlord, the list has the ability to close the gap quickly. We rolled up a random mission from the mission packet and played Mission 2, Unlimited Power, which has a center objective controlled end game for the primary, with Power Level Kill Points as a Secondary. We rolled Spearhead Assault for the deployment, joked that we seem to always play each other on a Hammer and Anvil setup, and then deployed. After deployment, James won the for first turn and opted to take bottom of turn. I dropped in my Meiotics in front of his line and then began my turn, shuffling forward just a little while staying out of range of his Robots unless they walked forward. I used a stratagem to run my Meiotics within 3" of his Dunecrawler on my left, failed a couple buff powers in my psychic phase, then set off the mines at the end of the charge phase, getting lucky and doing 12 wounds to the Onager, killing it outright and managing to get First Strike in the only way I could. In his turn, James moved up to get in range and plinked some ineffective fire off of my Flyrants on the table thanks to the Malanthrope, but did manage to wipe out the Warrior unit for his own First Strike point. In my second turn I used a combo of Opportunistic Advance and Swarmlord to launch the Stealers across the board and into the Knight, they then wrapped around the sides and touched both Robot units to stop them from firing. 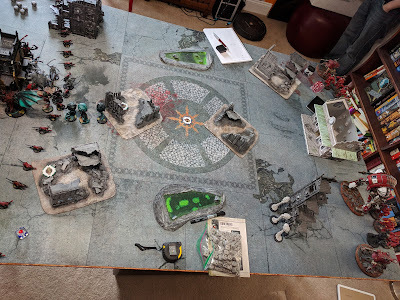 The rest of the force moved up to the center, and my final Flyrant dropped in on the right flank to also threaten the Robots, though he failed his charge. In the bottom of the turn, the knight walked away from the handful of remaining Stealers and further into my lines to try to slow the tide. The Robots backed up out of combat. What little shooting James had went into clearing out the remaining Genestealers. From there the Knight charged in to my Zoanthropes and Maleceptor, but I made my invul saves and not much happened. Turn 3 saw a second flyrant go forward and join the one that had dropped in, while the Warlord flyrant made a beeline for the surviving Dunecrawler. Psychics took down a robot and put a bunch of wounds on the already damaged Knight. Various combats then saw the twin flyrants kill a Robot and my Warlord kill the Onager. 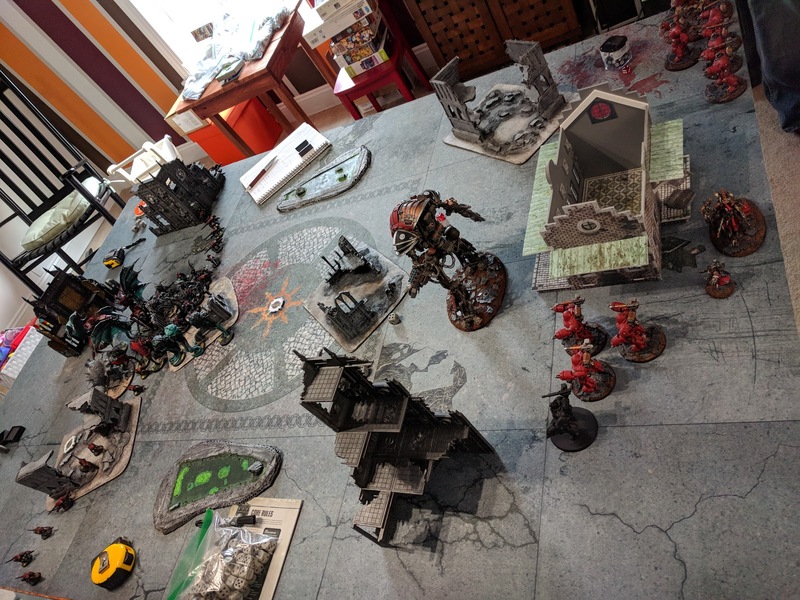 The knight survived on a single wound in the combat with Swarmlord, Maleceptor, Malanthrope, and Termagants, but didn't do much in return. 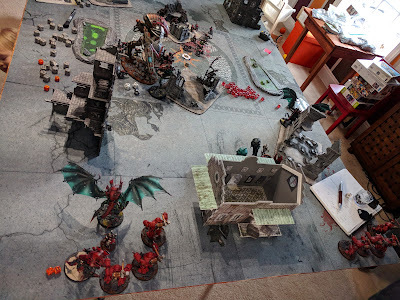 The bottom of the turn saw one flyrant take a handful of wounds, and then the Knight fell in the melee, failing to punch Swarmlord to death thanks to a Command Reroll save. From there the game was largely cleanup, with Cawl and the damaged unit of Robots and accompanying Datasmith falling. The central group of monsters trundled toward the surviving Robot unit and prepared to converge on turn five. My takeaways from the game were that I was impressed by the Zoanthropes, again, and that this was a bit of a mismatch, with my list putting out a bunch of mortal wounds while James's list relies on the durability of just a handful of models. From a list-building perspective, while I like the Zoanthropes, I don't actually have the models ready to go and am not confident in getting the time to do so. I also felt a little light on board control, particularly after sacrificing the Genestealers. Lastly, the 10-man termagants and the minimum Warrior squad felt like easy pickings for Kill Points purposes. Considering every single mission in the pack has some element of kill points, this felt a bit like a weakness. The army has a fairly short ToDo list of the Maleceptor and 3 Meiotic Spores, with bonus points for adding squad markings of some sort to the two units of Termagants. That said, I don't have much shot at maxing the WZAE rubric in part because of a lack of meaningful conversions across the army. My go-to models to check that box are my Mawlocs, but they got hit so hard by the FAQ I can't imagine adding them in, though I could make it work list-wise without too much trouble. Any thoughts on the list? Let me know in the comments. Also, I have a request out to List Doctors Nick Nanavati and Matt Root from The Brown Magic for Tyranid lists they would take to WZAE, so stayed tuned for a follow-up article where I plan on comparing what they came up with.